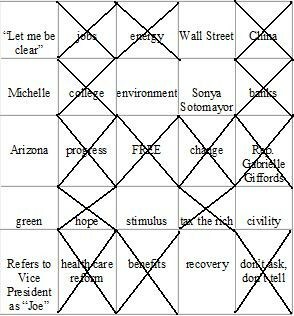 My bingo card did very well. I got at least 13 of the 24 terms I put down–over half! President Obama didn’t refer to Don’t Ask, Don’t Tell by name, but he did make a clear reference to it. During the first half of the speech, I regretted putting “tax the rich” on my card, figuring he would never actually say it, and even though he didn’t use those three words together like that, boy did he ever come out and say that he wanted to tax the rich! What did you win? ‘Increased taxes to stimulate further recovery.’ Sorry, that’s a loss.